Home Companies Wuxi ComiX Vulcanization Technology Co.,Ltd. steel cord conveyor belt vulcanizing. chemical industry ,tobacco ,and food automatic line field. CZ-CMX temperature controller box 1 set CZ-CMX control box has the new structure, you can put circle the electrical lines on it, prevent the wires lost. 01) Q: Do you have any certificates for the vulcanizing machine? A: We have CE Certificate and ISO9001:2008 for the machine. 02) Q: Normal delivery time? A: About 15 working days. Customized machines will take a bit longer. 03) Q: Will you test the machine before shipping? A: Yes, each machine, we will install and test before shipping. 04) Q: What after-sales service will you supply? 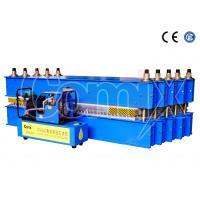 05) Q: Whether can visit your workshop to see how to manufacture the machine? A: No problems, you are always welcomed to visit us. 06) Q: Can I be your agent in our area? us to negotiate the agency mattes in details. 07) Q: How to get more informaition?